Very life like cast aluminium foal standing 73cm tall. 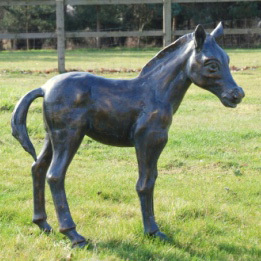 Finished in an “aged bronze” effect colour the very detailed foal looks fantastic. Standing 73cm tall, made from aluminium this ornament will not rust, although in time you might wish to repaint it as the finish weathers. This foal are delivered direct from the supplier and we are asked to quote 2 to 3 weeks delivery but please contact us if you would like us to check.